Hey everyone! 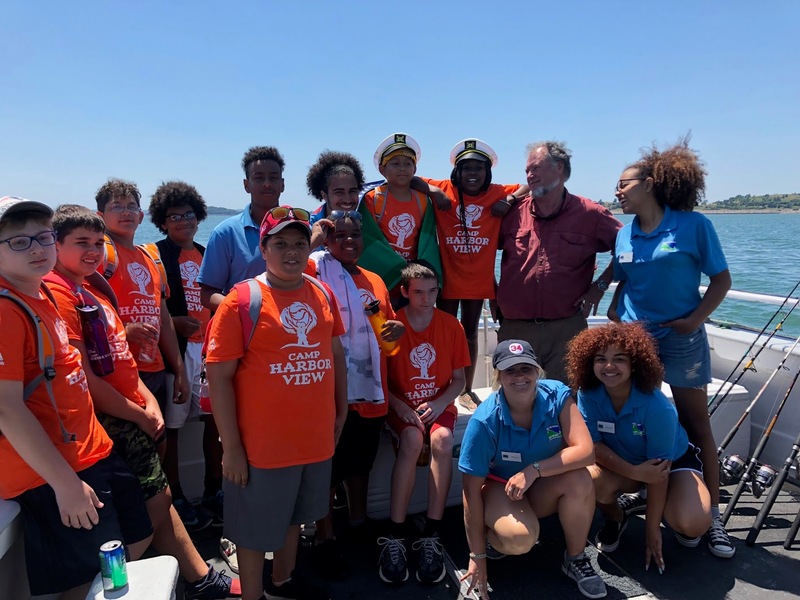 Senior Harbor Educator Jules here filling you in on the second week of programming at Camp Harborview and our awesome day of catching flounder aboard the fishing vessel Belle. As I was away for some of the first week of programming at CHV, I was excited to be getting back into the thick of it with my junior program staff and the campers. After ensuring everyone was aboard our ferry, the Provincetown II, we quickly set course for camp and an action packed first day of fishing on the pier. 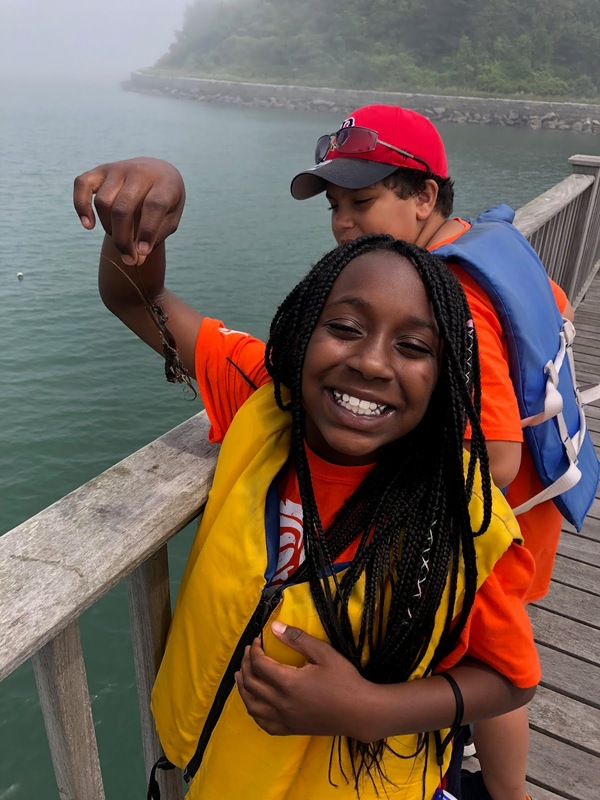 As soon as we touched dry land we sprinted to our stations; baiting crab traps, tying up flounder rigs, and creating a touch tank for the campers to play with. My stellar team for the week consisted of LHE Maeve and JPA’s Jovanni, Lea, Abel, and Aleena, all great staff who I have come to know and rely on day in and day out. The first day started out great, and we quickly got the kids hooked up on a skate (a prickly flat fish belonging to the ray family). These fish can be a bit tricky to deal with, as they have a tail with barbs on it that have been known to cause some damage. I was able to safely get the hook out of its mouth, and showed it off to some inquisitive campers. 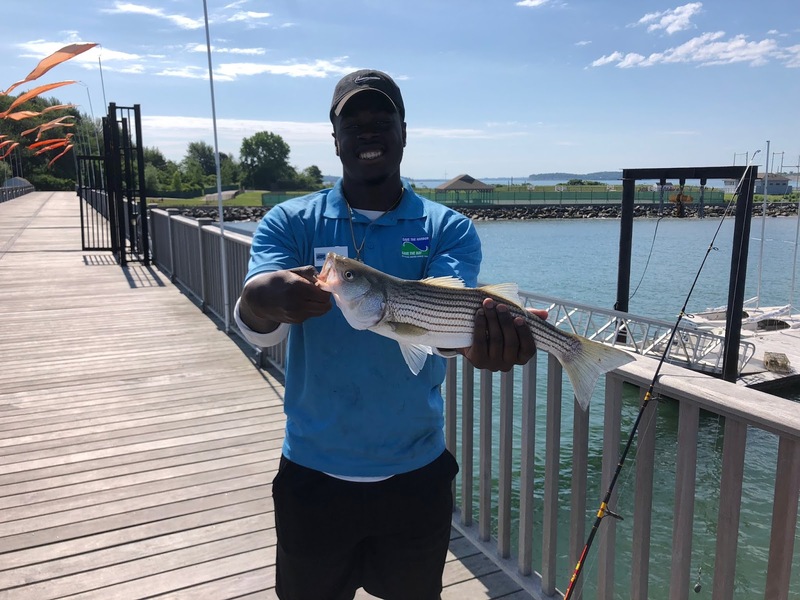 Many of the kids that we have worked with over the past week have never held a fishing rod, let alone caught a skate, so it was very informative and rewarding for them and us to interact with these aquatic creatures. We ended up catching two more of the rays that day, and even a baby flounder! We were also able to catch several types of crabs, ranging from alien-like spider crabs to invasive green crabs and a few stone crabs as well. The campers enjoyed holding the crabs, and we taught them how to tell the difference between the males and females by looking at the shape of their aprons (the almost pizza shaped part on the bottom of a crab's shell). The next day was even more fun, as we were able to take several campers out on a charter trip with Captain Charlie of the Belle. Charlie is a phenomenal guide to the fishing holes scattered throughout Hingham and Quincy Bay, and quickly put us on some flounder. I spent most of the trip hooking up sea worms to use as bait, and almost every kid was able to reel in a fish or a crab. It was fun showing off the differences between a flat fish like a flounder and a small missile shaped fish like the mackerel. Time went by quickly and before we even knew it, it was time to head back to the dock. A huge shoutout and thanks again to the crew of the Belle! The rest of the week seemed to go by in a flash of skate, crabs, and then even more skate. All in all I think we caught at least 9 of those prickly fish. We did however manage to catch some lobsters in our trap, and on the final day of the week we even caught a striped bass! It was an amazing week of programming and I can’t wait to see what we catch next!